Paul J. Jacobi (Könisberg, 1911 – Jerusalem, 1997) was a doyen of Jewish genealogy in his time. He spent half a century meticulously investigating lineages of leading Ashkenazi, mainly rabbinic, families. These erudite volumes are the product of his labours. 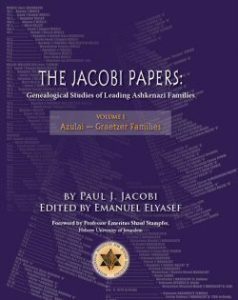 Running to 2,298 pages in all, and containing countless family trees going back many centuries, they are a cornucopia of genealogical knowledge and data of relevance to all family historians and scholars working in various disciplines on Ashkenazi Jewry. General readers should search the Surname Index for mentions of their specific families. Paul Jacobi came to Eretz Israel/Palestine in 1919. He trained as a lawyer in Germany and England and was called to the Palestine Bar in 1936. During World War 2 he was a member of the Haganah. Involved in multiple public activities and also active in local politics, he ran unsuccessfully for Mayor of Jerusalem in 1965. A polymath, Jacobi’s deepest passion was for Jewish history and, in particular, for Jewish genealogy. He was a founding member of the Palestine Jewish Genealogical Society when it was formed in 1937, and enjoyed international renown as an expert in his speciality – the genealogical origins of Ashkenazi Jewry. Click here to purchase volumes.